We know transportation directly impacts our ability to access employment, shopping, medical needs, and entertainment. But did you know that it also greatly impacts our health? According to experts at the Department of Health, if given choices to travel by a combination of safe walking, cycling, and transit, there is a good chance we will be more active, socialize with neighbors, relieve stress, and even be happier. 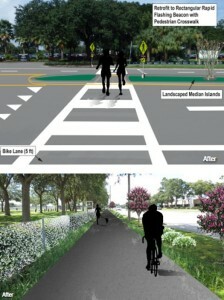 The MPO had its first collaboration with the Florida Department of Health on the George Road Complete Streets Study. The number of residents in the study area near the growing network of trails that the George Road study would help connect were assessed. Surveys of those residents confirmed that being in nature and active on the trail would have a restorative health benefit. The MPO looks forward to continuing this healthy collaboration for future transportation studies!